We hope you experienced #TrailBliss in our multi-terrain marvel running route around the Cholavaram lake in this 6th year edition of our Chennai Trail Marathon today. Our team always looks forward to hear about your experience, what you loved about the event and where we can take things to the next level. Do share your feedback with us in this public post or drop us an email. Here are the first set of videos and photos captured by the lens of our photography volunteers. Can’t find your trail, finisher or podium click yet? No worries… much more to come shortly. Always remember that the journey is greater than the destination! The trail experience is much more blissful than chasing your watch. Don’t find your name or see a wrong timing below? NO PANIC – just drop us an email and we will revise. Note – we are still working on adding a few missing entries. Final list will be published shortly. Meet the team behind #CTM17, the volunteers (not all shown) who worked hard behind the scenes of the 6th year edition of CTM to indulge 800+ runners from 30+ cities across India in #TrailBliss. If you loved the trail then don’t miss to drop a comment to our team. We sincerely thank all the runners who donated generously for the associated cause of CTM. CTC’s Ainthinai is on a mission to create a greener and more sustainable planet for all of us to live in. Plantations, Maintenance, Clean Ups, Organic Farming, Terrace Gardening, Tree walks, Nursery Maintenance etc comprised most of our activities. Our green team today has risen up with more than 6000 Active followers and Volunteers who have supported us in more than 400 events till date. Read more here. Green Day is Ainthinai’s Annual Event where more than 1000 saplings will be planted on a single day with support from 500 Volunteers. This one day event will be the seed for many new comers to Ainthinai to understand the need of the hour and the positive effects of planting a tree. This one day event will connect each of you with a number of nature and social enthusiasts who will be happy to guide and support to live a life close to nature and without harming it. Join us on Sep 17th. Did you like the Chennai Trekking Club Experience? 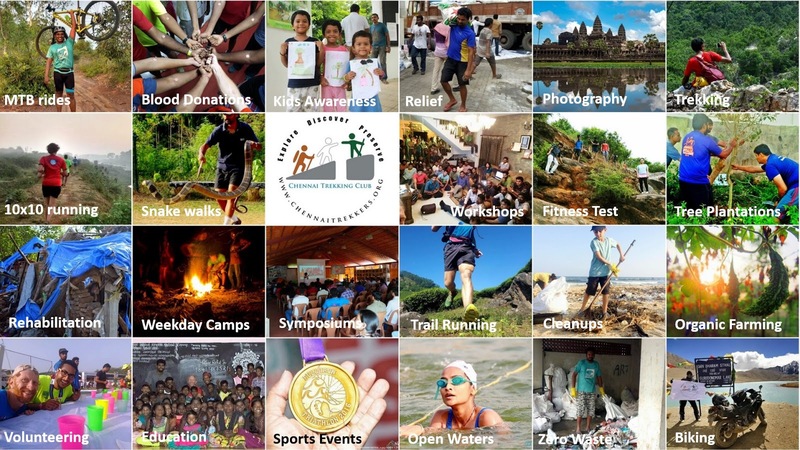 Did you know that we are a 40 thousand member non-profit volunteer based organization which organized hundreds of sports, outdoors, environmental and social activities throughout each year? Want to get to know us better, follow and join our weekly activities or annual events? Check our Web site or Facebook.